This week's been a pretty hectic week, with everyone seemingly rushing for project deliveries and due dates. It was very exhausting, and a number of events happening concurrently as well. So, I decided to have a fun weekend, so that I can shake the stress and the draggy feeling off me. This is a rather different type of futuristic robot movie, I must say it's pretty darn good! If you haven't seen it, you should catch it! 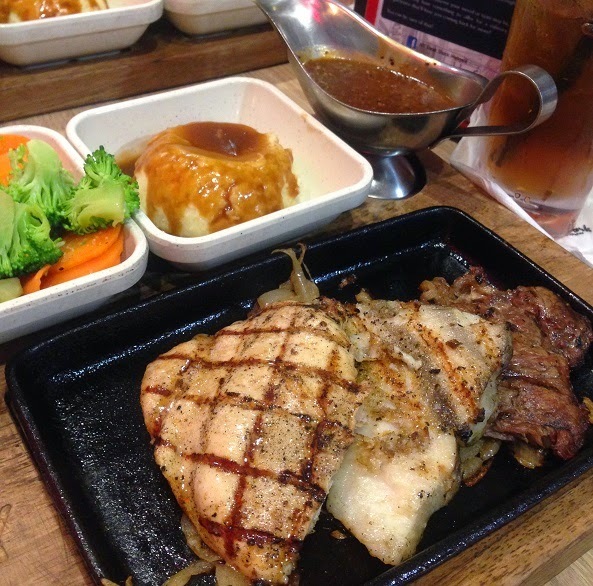 Lunch at New York Steak Shack at Sunway Pyramid! and it comes with a soft drink. So, that's what both Min & I had. However, what surprises me is that the meat served were nearly half the thickness of the usual serving. Nevertheless it's still very nice! Then, we went for a short walk and shopping, since Min wanted to look for a comforter. Looked around and she found what she wanted. I must she's a very spontaneous person, hahaha. By evening, I had a marathon to attend. The panoramic view of the arrival location. The panoramic view of the line of runners! And that's me at the finishing line! Look at all the goodies I got from the race!